At Muvi, we integrate with any Ad server which is VPAID compliant in accordance with IAB guidelines. 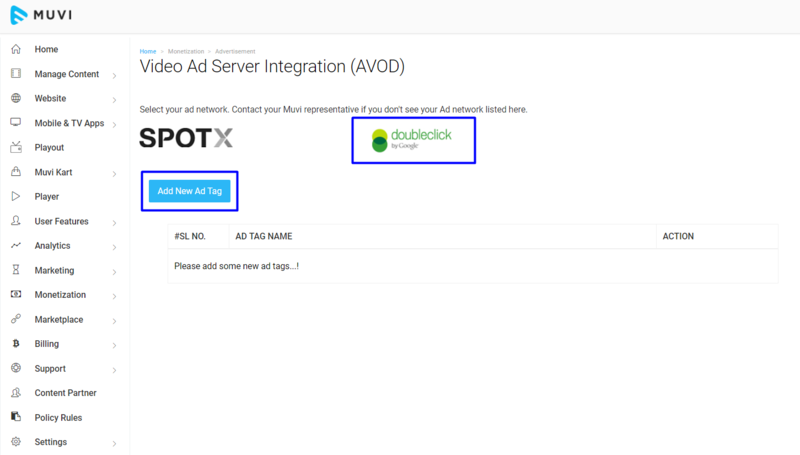 We have out of the box integration with SPOTX, and DoubleClick Ad Exchange. You can create multiple Ad Tags (For both SPOTX and DoubleClick) and link them to multiple content . Before setting up your Ad Integration, first you need to enable this feature in your CMS. To enable Advertisement, go to “Monetization” --> “Settings” in your CMS. Once your publisher account is setup, please go to “Monetization” --> “Advertisement” in your CMS (See Below Screenshot). Note: You can add multiple Ad Tags by repeating the above procedure. By creating multiple Ad Tags you can add different ads to different content in your store. Go to “Monetization” --> “Advertisement” in your CMS (See Below Screenshot). Currently, we are supporting Ads for Pre-roll, Mid-roll and Post-roll for SpotX and Pre-Roll, Mid-Roll for DoubleClick on web browsers only. For DoubleClick, there is no option available to enable the “Pre-roll”, “Mid-roll” in the Muvi CMS. You need to enable this in the DoubleClick ad server. You can integrate ads in all types of content including, single part, multi part, paid (SVOD, PPV) and free content. Currently, we do not support ads for live streaming content. Link the SPOTX Ad Tag (Please use the sample Ad Tag 85394) to a Non-DRM content in your Content Library by following the above mentioned method. You can edit or delete the Ad Tags you have added to either SPOTX or DoubleClick. To edit an Ad Tag, click on the Edit Icon. Make necessary changes and click on "Save". The Ad tag will be modified. You can configure your video ads and collateral itself from your Ad Servers. *Note: For any third party video link, we only support .m3u8 format. We support all kinds of ads for SPOTX and doubleclick ad server in mobile browsers for non-DRM content. Note: Currently, we don't support ads in TV Apps.